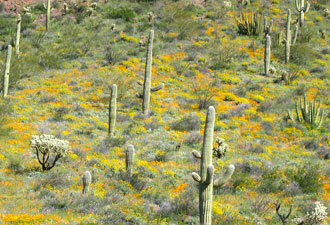 In early spring, when most of the country is recovering from winter frosts, life flourishes in the Sonoran Desert. Daytime temperatures at Organ Pipe Cactus National Monument range from 72 F in March to 88 F in May. A day without sunshine is almost unknown. After soothing showers, bright golden swaths of wildflower cover many of the lower mountain slopes. The slightest breeze sets them dancing in time with the music of the organ pipes. Overhead, hawks and golden eagles slip and slide on the wind to set the aria with a visual crescendo. At night, the Sonoran Desert sky is so clear that stars look close enough to touch. When the moon is in view, even if only a quarter phase, no other light is needed for an evening stroll. During such times it is easy to lean back, watch the sky from horizon to horizon and contemplate our human’s insignificance in the vast universe. At the Kris Eggle Visitor Center, visitors admiring new museum exhibits can explore the ways of the Sonoran Desert. 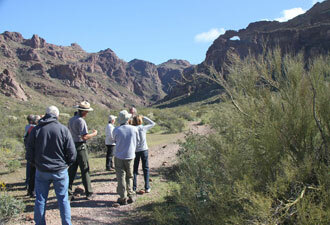 The free van tour of the 21-mile Ajo Mountain Loop is guided by a ranger and immerses visitors in the desert landscape. Many are awed by the thousands of organ pipe, saguaro, cholla and other cacti that march into the distance in every direction. A day hike on the Estes Canyon-Bull Pasture Trail is an up close and personal experience with the desert. It takes the visitor back in time. From the overlook at trail's end, the view to the western horizon is a classic southwestern landscape; rugged mountains and a basin studded with the iconic saguaro cactus. In the far distance, a rugged historic path known as El Camino del Diablo, or The Devil's Highway, leads toward Yuma. To the east are the higher Ajo Mountain peaks and Bull Pasture where some of Pancho Villa’s supporters hid out while the U.S. Army was hunting them farther south in Mexico. The largest maternal colony of lesser long-nosed bats in North America makes its summer home in an abandoned mine on the monument. Thousands of females give birth and suckle their young through the first part of life. After the cactus flowers are gone and their fruit depleted, the colony will migrate east beyond Tucson and then south to Mexico for the winter. Minnow-sized Sonoran Desert Pupfish swim in two small ponds next to the visitor center patio. School children from the town of Ajo, AZ helped build these ponds as a way to preserve this endangered species, in an additional setting near their natural habitat at Quitobaquito, a historic spring and Oasis in the monument. Another endangered species, the Sonoran pronghorn, is being reintroduced onto suitable habitat within the monument to increase the species’ chances for survival. 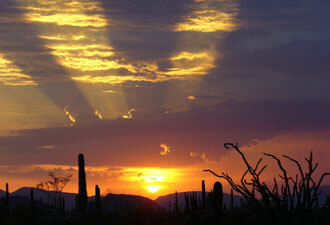 Organ Pipe Cactus National Monument provides opportunities for adventure and solitude within unmatched scenery. If you visit with an open heart, you may find that the Sonoran desert inspires you to dream your own dreams and make your own memories.